BMW Team RLL closed the inaugural North American season of competition for the BMW M8 GTE with third and fourth place GTLM class finishes at the IMSA WeatherTech SportsCar Championship Motul Petit Le Mans. John Edwards, Jesse Krohn and Chaz Mostert finished third in the No. 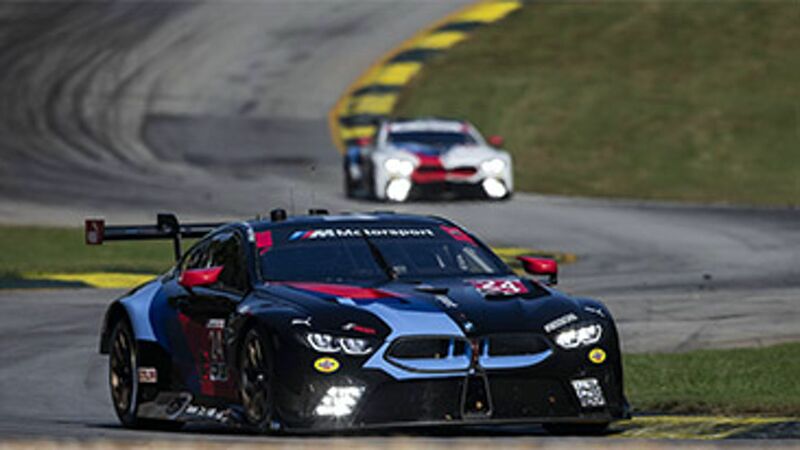 24 BMW M8 GTE, completing 419 laps of the 2.54-mile, 12-turn Road Atlanta circuit in the ten hour race after starting from the pole position. Bill Auberlen, Connor De Phillippi and Alexander Sims finished fourth in the No. 25 BMW M8 GTE, only 1.755 seconds behind their sister car after taking the green flag from the seventh spot. The race was won by the No. 911 Porsche 911 RSR. 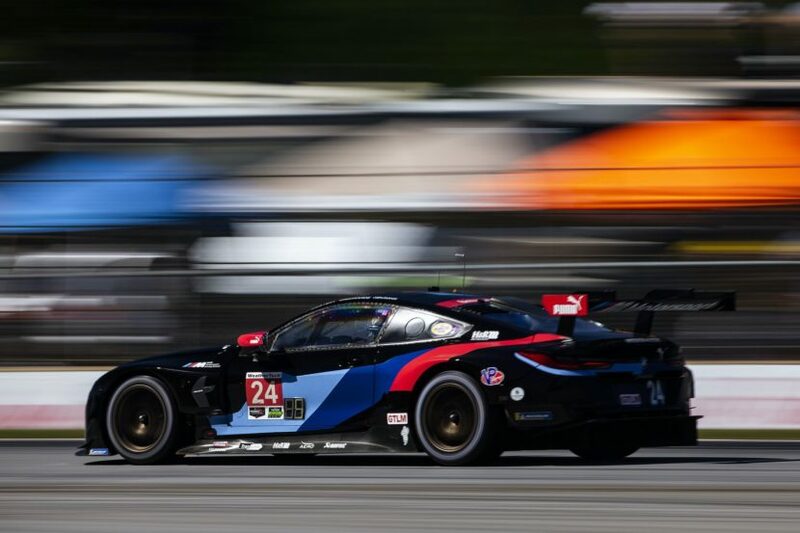 Today’s race saw BMW Team RLL execute flawlessly through ten hours of ever-changing strategy to keep both BMW’s on a podium pace, only the 25 machine falling from the lead lap for a few hours, but fighting to get it back. In addition to finishing only 1.755 seconds apart after 10 hours, the BMW’s fastest laps were even closer – only .08 seconds apart. Edwards set the fast lap for the No. 24 M8 (1:18.185 minutes) on lap five and De Phillippi set the quick time for the No. 25 M8 (1:18.105 minutes) on lap 268. By every account the 2018 season can be considered a great success. BMW’s newest racing cars scored two victories (VIR, Laguna Seca), two runner-up finishes (Sebring, Mid-Ohio), two third place finish (VIR, Road Atlanta) and three pole positions (Sebring, Mid-Ohio, Road Atlanta). Drivers De Phillippi and Sims finished sixth in GTLM Driver points. Edwards and Krohn finished eighth. The No. 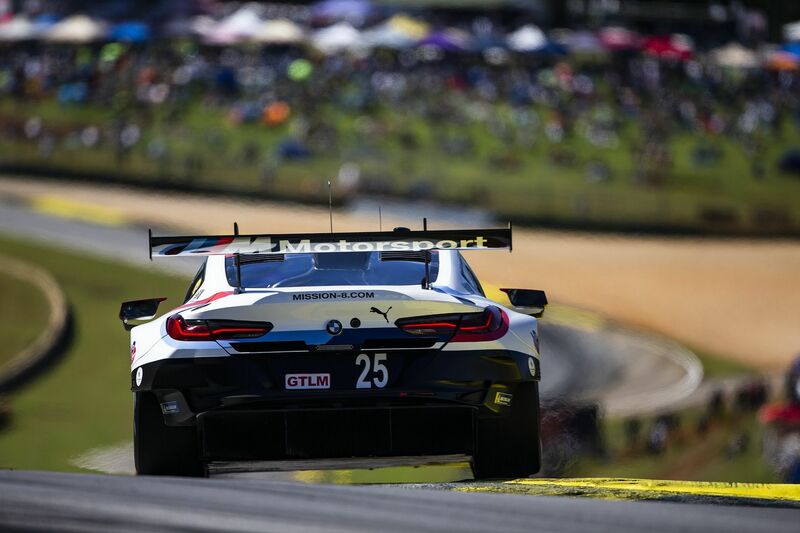 25 and 24 BMW M8 GTE finished sixth and eighth respectively in the GTLM Team standings. 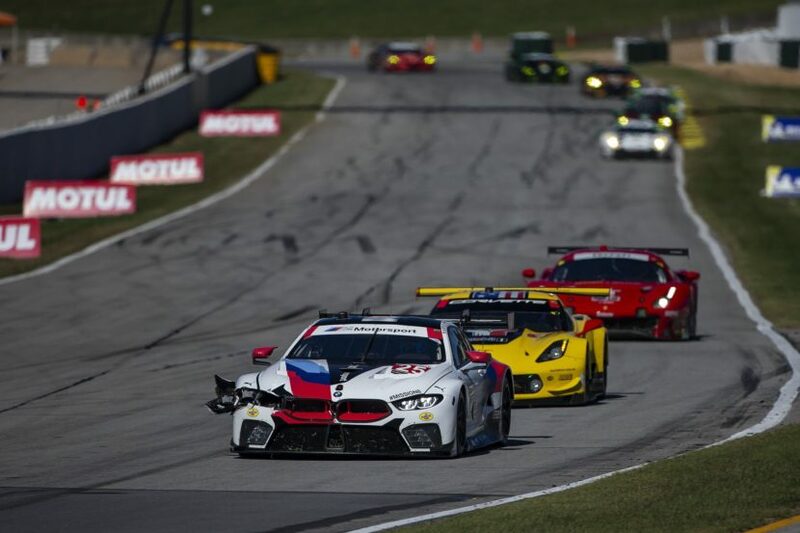 BMW finished fourth in GTLM Manufacturer points. This weekend also saw BMW Team RLL complete its 10th season of racing with BMW. Through four models, the BMW M3, BMW Z4, BMW M6 and BMW M8 the team has totaled 74 podium finishes, including 19 victories since 2009. Developed along parallel tracks with the racing BMW M8 GTE, deliveries of the first new 2019 BMW 8 Series road car, the BMW M850i xDrive Coupe, is on the horizon. The No. 96 Turner Motorsport BMW M6 GT3, of Dillon Machavern, Markus Palttala and Don Yount, – the winners at the Six Hours of The Glen this season – were the innocent bystanders in a multi car crash that caromed Machavern into the turn one wall, eliminating the car from the race on lap 68. On Friday, BimmerWorld Racing finished the Continental Tire SportsCar Challenge Fox Factory 120 on quite a high. Drivers Devon Jones and Nick Galante captured the Street Tuner class Driver’s Championship with a third place finish in their No. 81 BMW 328i. The duo paired for four victories this season to also secure BimmerWorld Racing the ST Team championship. To make the day even sweeter, BimmerWorld owner James Clay and Tyler Cooke captured the first North American overall race win for the BMW M4 GT4, winning the two-hour race in the Grand Sport class No. 82 machine. Previous post Which is the best looking generation of BMW 3 Series? Copyright © 2018 BMWBLOG. All rights reserved. BMWBLOG is an independent private enthusiast site dedicated to BMW fans around the world and is in no way affiliated or owned by BMW AG.